When Martin Bax founded his quarterly magazine, Ambit, in 1959, Britain was sleepwalking into the global village. Almost 50 years later, with Bax still at the helm, Ambit has become something of an institution. Recent issue no. 188 contains the usual mix of short fiction and poetry by contributors both new (Cyrus Shahrad) and familiar (Alan Brownjohn) with a colour portfolio of pictures by Dominik Klimowski. Nothing unusual about this. Except that Ambit’s insistence on giving images and literature equal weight (as opposed to making images illustrate texts) used to set artists and designers against writers. If the magazine owes its longevity to any one thing it is the energy of Bax, a paediatrician turned novelist whose skill at riding out financial storms is surpassed only by his amazing instinct for attracting, nurturing – and keeping – talented people. Ambit’s art director is the illustrator Mike Foreman, whose eye for new talent helped establish the magazine as a test-bed for the best British artists, illustrators and photographers. Soon after he joined the magazine, for issue no. 11, Foreman set the bar at maximum height by publishing graphic work by Peter Blake and David Hockney. Both artists had studied at the Royal College of Art, where Foreman himself had been a student and later a tutor, and which was to become synonymous with Swinging London after Ken Russell’s 1962 television documentary, Pop Goes the Easel, which glamorised the lives of four of its students – including Blake. And, in the 1970s, Ambit was among the first publications to recognise the merit of a then unknown artist called Helen Chadwick. Bax and Foreman aimed to produce a magazine in which pictures and words would complement each other, but somehow Ambit got stuck with the reputation of being a literary quarterly with illustrations. So one objective of its 2000 redesign, by John Morgan studio, was to reassert the visual content. Luckily, Morgan was no stranger to the magazine, having previously worked at Derek Birdsall’s studio, Omnific; Birdsall had redesigned the title in the mid 1970s. As Bax tells it, that first redesign came about because, hearing Birdsall speak of using Ambit extensively in his teaching, he insisted that the designer return the favour. In the event Birdsall came up with a template that endured many changes in taste and fashion. Templates are a good way for designers to have an influence ‘at distance’ (though many, like Birdsall, opt to design the covers) and they are popular with the publishers of small magazines because they save money, allowing the editors to run in copy and pictures themselves. Morgan rejigged his mentor’s template to give the editorial team greater control. He has preserved some of the innovations that Birdsall introduced back in issue 65 (separate fonts for poetry and prose, the wrap-around cover, size and perfect binding; the masthead in Eygptian Condensed Bold) and introduced some of his own (changing some of the typefaces and moving the contents to the back cover). Morgan’s greatest inspiration was, however, Ambit itself: or at least the original typical low-budget mag with a basic paste-up format designed by Alan Kitching in 1959. At the rear of Ambit no. 183 there is an intriguing four-page ‘advert’ that comprises two pages of found type and two pages of black and white photographs. This is Morgan’s light-hearted, personal homage to ‘the old Ambit’. Morgan believes that the issues of the 1960s and early 70s were among the best – not simply because they possess (as he puts it) the ‘charm of the undesigned’, but because they are the products of a very special convergence of culture, politics and dynamic personalities. At a time when the literary establishment appeared steeped in the past, small magazines such as Ambit and Michael Moorcock’s New Worlds were havens of experimentation. In addition, underground titles, such as Jeff Nuttall’s My Own Mag, mixed literature, art and activism. What these publications may have lacked in funds and sophistication, they more than compensated for in creative risk-taking. (Hand-made, hand-stapled and hand-distributed, My Own Mag was first in Britain to champion William S. Burroughs and his radical cut-up collage technique.) While Ambit could never be described as ‘underground’, it was often a thorn in the side of the establishment (once provoking the Arts Council to withdraw its grant after announcing a literary prize for the best writing made under the influence of drugs) and provided a forum for alternative views. In 1965 Bax persuaded the novelist J. G. Ballard to join Ambit as prose editor, and it was Ballard who about two years later introduced his friend, the protean artist / designer Eduardo Paolozzi (1924-2005, see Eye no. 21 vol. 6). Ballard was among a handful of British authors (another was B. S. Johnson, see Eye no. 36 vol. 9) that wanted literature to be as formally innovative as visual art and to address themes about the emerging media society. Because of Ambit’s policy of pushing at the boundaries separating text and image, the novelist was free to produce several remarkable and rare works of visual fiction that might never otherwise have existed. One of these was Plan for the Assassination of Jacqueline Kennedy (Ambit no. 31). It is a collage of text and press pictures (depicting James Dean, Jack Ruby and Brigitte Bardot). The layout has the urgency of a newswire and its language is borrowed from forensic science. While these pages were not consistent with Ambit’s design, this was not a deterrent to further experimentation. On five other occasions Ballard bought the back page to publish mock advertisements (the inspiration for Morgan’s recent ‘culture jamming’). One of these pseudo-commercials is dominated by an abstract ‘worm’s eye’ shot of a woman’s hands and face, with text that reads: ‘Fiction is a branch of neurology: the scenarios of nerve and blood vessel are written mythologies of memory and desire.’ Writer / musician Michel Delville (author of J. G. Ballard and The American Prose Poem) has argued that this page was a dry run for Ballard’s Crash (1973, see Eye no. 52 vol. 13), its text a summary of the central ideas underlying the novel. By the time Paolozzi joined the editorial team he was in his forties and well established as both and artist and tutor at the Royal College of Art. The Edinburgh-born sculptor, print-maker and designer was also a leading member of the Independent Group (ig). Famously based around the Institute of Contemporary Arts in London, its roster of talent included artists Richard Hamilton and Nigel Henderson (1917-85), and the architectural critic Reyner Banham (1922-88). As early as 1953, in exhibitions such as ‘Parallel of Life and Art’, Paolozzi had demonstrated a fascination for the sort of iconography admired by Ballard, that was culled from the pages of popular press, science journals and primarily sourced from American popular culture. The cultural importance, in the 1950s, of the influx into Britain of American magazines and comics was summarised by Banham: ‘One of the great trainings for the public’s eye was reading American magazines . . . Those ads may look yucky now, to the overfed eyes of today, but to us they looked like Paradise Regained – or at least a paper promise of it.’ Paolozzi and Ballard were interested in many other things frowned upon in ‘highbrow’ circles, including Surrealism, and the emerging theories of the Canadian media guru Marshall McLuhan. During the 1970s, when Paolozzi was most intensely engaged with Ambit, its pages played host to a number of his speculative visual novels, autobiographies and film scripts, all meticulously designed by the artist prior to layout. Wherever he went, Paolozzi carried plastic bags bulging with press clippings that he would later categorise and file for easy access (for a flavour of this material visit his ‘Krazy Kat Arkive’ at the Victoria and Albert Museum’s Archive of Art and Design), a combination of magpie and bureaucratic traits perfectly suited to the world of magazine production. Perhaps encouraged by Ballard, Paolozzi turned his hand to collaging fragments of text snipped from found sources. One of his first contributions was the collage novel, Moonstrips Empire News (1967), which set the tone for much that was to follow. The texts are seamless assemblages of urgent phrases sucked, Burroughs-like, from the mediascape and rendered meaningless. In an echo of Ballard’s style, Paolozzi’s writings invoke the Babel of specialist argots that constitute mid-twentieth-century communications. For Ballard the spectrum encompassed ‘the sinister jargon of Rand Corporation “think-men” to the non-communicating discourses of politicians and copy-writers’. Mimicry and surprise are also present in Ambit no. 43 (1970), with the first of a series of spoof news items. Reconstituted from the pages of discarded newspapers, they possess a hierarchy of attention-grabbing headlines (‘Fierce Battle Now in Progress Over Communication Circuits’; ‘8mm Films Depicting Students Riots Sell Well’), stand-firsts (‘Shot, Edited By Amateur’) and bylines, and could pass for the real thing. The effect of being bombarded by textual information is enhanced by an assault of visual codes that are present in appropriated fonts, photographs, logos and layouts. By the 1970s Paolozzi’s enthusiasm for the macho elements of American culture seems to have cooled, perhaps, as the art historian Robin Spencer has suggested, because of firsthand experience of the United States as a visiting professor during the Vietnam years. The critical flavour of the collage novel Why We Are in Vietnam (part one was published in Ambit no. 41, 1969) is implicit in the artist’s repetition of media images of violence, and their juxtaposition with images of smiling politicians. Another of Paolozzi’s anti-war interventions was a projection to accompany an Ambit jazz concert (organised by the trumpeter Henry Lowther), sourcing a kaleidoscope of images from his fabled archives for the performance of the 1975 Vietnam Symphony. Content was typically eclectic and seemed calculated to highlight the surrealistic nature and sensory experience of rapid-fire media coverage. It encompassed the absurd (pin-up girls, advertising slogans), the chauvinistic (aerial shots of the first us nuclear aircraft carrier, a photograph of an astronaut on the moon, a cigar-chomping general, Nixon smiling) and the tragic (anthropological portraits of startled ‘natives’, reportage shots representing poverty). This implicitly critical edit reappeared inside Ambit no.&#8239;63, interleaved, in grid-like formations, with texts by Bax. Not unsurprisingly, Paolozzi’s experimental literature remains relatively unrecognised in the world of art, which is so often averse to all things literary and ephemeral. Ambit gave him a context that demonstrated a social conscience, and complete freedom to indulge his passion for collaboration and design. Paolozzi believed that artists – like designers – should be proud to produce functional outputs, and this would have been reason enough to work with a magazine as a ‘canvas’ or multiple. A portion of his considerable oeuvre consists of public art (he called it ‘social art’) in the form of murals and sculptures. He once described them as ‘counterpoints to subjectivity’, and seemed to enjoy collaborating with people with different skills as he did when he produced the mosaics for London’s Tottenham Court Road Underground station (completed in 1986). It is not impossible that he viewed his contributions to Ambit as a kind of ‘social art’ that was cheap, disposable and recyclable (perhaps in a collage). In true Ambit style, Ballard still has his name on the masthead. Paolozzi’s was there too, until his death in 2005. That Ballard, Paolozzi and Bax, along with Foreman, viewed themselves as a kind of ‘Ambit family’ is illustrated by a cover photograph on issue 50 in which all four men pose behind a semi-clad Euphoria Bliss, Ambit’s enigmatic ‘muse’. No book ever emerged from their experiments of the 1960s and 70s. But perhaps magazine dissemination should be considered sufficient. The small magazine, with its intimacy and loyal discerning readership, is arguably the perfect vehicle and catalyst for talents such as Paolozzi and Ballard who had axes to grind about, say, the provinciality of British culture in the postwar years, consumerism and Vietnam. 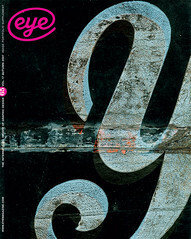 During an intense decade (roughly 1967-77) they contributed to those debates and helped shape an unusual magazine in which images and texts could be integrated, counter to the usual literary formats and in defiance of design etiquette. Literary magazines such as Granta and Zembla may not have been possible without the Ambit model. When a long-established title redesigns, it is often to compete with fresher-looking rivals for new readers. The new Ambit manages to communicate its visual content more effectively, thanks to John Morgan’s ‘old Ambit’ design template. Some critics think that the literary magazine may have become too closely associated with its coterie of 1960s artists from London, centred around the Chelsea Arts Club, and that Bax’s inimitable voice has been given too much prominence. On the other hand, if the core reader is known to relish these touches, and it is felt that they constitute Ambit’s unique selling point, then no marketing expert worth his salt would recommend tinkering with the chemistry. For artists and designers, Ambit has long been special because of the unique context it gives images – sometimes in defiance of literary purists. For the magazine to keep fulfilling the valuable role of portable gallery for new talent, it needs to attract today’s equivalents of Paolozzi and Ballard. Is this happening? The vitality of the old Ambit lies in the way in which it uniquely reflects, and is shaped by, its special time and place. We may have to wait a while before we can say whether this chemistry persists at the rejuvenated Ambit. 1. Jeff Nuttall, Bomb Culture, MacGibbon & Kee, 1968, p.151.